Interior of Saint-Maimbœuf Church in Montbéliard (Doubs, France), taken in HDR. English : Interior of Saint-Maimbœuf Church in Montbéliard (Doubs, France), taken in HDR. English : This is a very high detailed animation of Mount Everest. It was created by scientists of the German Aerospace Center. English : The Mona Lisa. Citroën DS, 1956, 1911 cm³ engine displacement, 55kW / 75hp, 155 km/h. English : Citroën DS, 1956, 1911 cm³ engine displacement, 55kW / 75hp, 155 km/h. English : Robber fly (Dioctria rufipes) with prey. 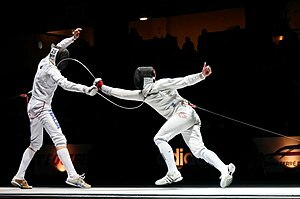 English : Final of the Challenge Réseau Ferré de France–Trophée Monal 2012 (épée world cup tournament in Paris): Diego Confalonieri (left) and Fabian Kauter (right). English : Mehndi is the application of henna as a temporary form of skin decoration in India, Pakistan and Bangladesh as well as by expatriate communities from those countries. Volcanic rock strata on Tenerife. English : Volcanic rock strata on Tenerife. English : A European Barn Swallow, also known as Hirundo rustica, pauses to rest on a fence post beside a freshwater lake on Lindisfarne Island. The western departures concourse of London King's Cross railway station, which opened on the 19th March 2012. English : The western departures concourse of London King's Cross railway station, which opened on the 19th March 2012. English : Standard size Tidal bore, close to Hangzhou (China) first bridge city. Vultures in the nest (Gyps indicus), Orchha, Madhya Pradesh, India. English : Vultures in the nest (Gyps indicus), Orchha, Madhya Pradesh, India. English : A computer generated flyby of Mount St. Helens (24s). An Antonov An-124-100 (RA-82028) of 224th Flight Unit inflight with 2 Sukhoi Su-27s of the Falcons of Russia aerobatic team, as part of the flyover contingent for the 2010 Moscow Victory Day Parade. English : An Antonov An-124-100 (RA-82028) of 224th Flight Unit inflight with 2 Sukhoi Su-27s of the Falcons of Russia aerobatic team, as part of the flyover contingent for the 2010 Moscow Victory Day Parade. English : Male Thaumatomyia notata fanning its wings to disperse pheromones from abdominal sacs. Kiril Lazarov, Macedonian handball player, playing for RK Zagreb, on August 22nd, 2009 in Ehingen (Germany), during the Schlecker Cup 2009. English : Kiril Lazarov, Macedonian handball player, playing for RK Zagreb, on August 22nd, 2009 in Ehingen (Germany), during the Schlecker Cup 2009. English : A male Marsh Frog (Pelophylax ridibundus) calling to attract a mate. Vocal sacs are inflated and deflated to amplify the call. Other frogs can be heard but not seen on the video. Male nilgais fighting (Boselaphus tragocamelus), Lakeshwari, Gwalior district, India. English : Male nilgais fighting (Boselaphus tragocamelus), Lakeshwari, Gwalior district, India. A woman using a keypunch to tabulate the United States Census, circa 1940 . English : A woman using a keypunch to tabulate the United States Census, circa 1940 . Hindu Bride, Ahmedabad, Gujarat, India. English : Hindu Bride, Ahmedabad, Gujarat, India. Lt. Col. Gabriel Green and Capt. Zachary Bartoe patrol the airspace in an F-15E Strike Eagle as the Space Shuttle Atlantis launches May 14, 2010, at Kennedy Space Center, Fla.
English : Lt. Col. Gabriel Green and Capt. Zachary Bartoe patrol the airspace in an F-15E Strike Eagle as the Space Shuttle Atlantis launches May 14, 2010, at Kennedy Space Center, Fla.
English : The detailed images recorded by SDO over the last year have helped scientists uncover new secrets about the sun. A view of the lake Bondhus in Norway. In the background a view of the Bondhus Glacier as a part of the Folgefonna Glacier. English : A view of the lake Bondhus in Norway. In the background a view of the Bondhus Glacier as a part of the Folgefonna Glacier. English : 70 years ago today, Electric Earthquake, the seventh of the 1940s Superman animated Technicolor short films, was released. Strobilurus esculentus (stipe), Family: Physalacriaceae, Location: Southern Germany, Biberach a. d. Riss. English : Strobilurus esculentus (stipe), Family: Physalacriaceae, Location: Southern Germany, Biberach a. d. Riss. English : NGC 2683 is a spiral galaxy seen almost edge-on, giving it the shape of a classic science fiction spaceship. Northeast Pavilion. View of Mural and coffers in Ceiling dome. Library of Congress Thomas Jefferson Building, Washington, D.C.
English : Northeast Pavilion. View of Mural and coffers in Ceiling dome. Library of Congress Thomas Jefferson Building, Washington, D.C.
English : Self-playing piano (so-called "player piano") from 1920 manufactured by Steinway & Sons. The recording is an excerpt of Saint-Saëns' piano concerto No. 2 played by pianist Harold Bauer. Taj Mahal viewed through a neighbouring arch, Agra, India. English : Taj Mahal viewed through a neighbouring arch, Agra, India. English : Harvest of white asparagus at Hockenheim, Germany. The Torch Bearers, sculpture by Anna Hyatt Huntington about the transmission of knowledge from one generation to a newer one; located in Ciudad Universitaria, Madrid, Spain. English : The Torch Bearers, sculpture by Anna Hyatt Huntington about the transmission of knowledge from one generation to a newer one; located in Ciudad Universitaria, Madrid, Spain. English : Fire-walking ritual of San Pedro Manrique, province of Soria, Castile and León, Spain. A native of a Brazilian village. English : A native of a Brazilian village. English : Work on potter's wheel, Opishnya, Poltava Oblast, central Ukraine, 2011. Skull and neck vertebrae cast of an Allosaurus fragilis specimen from Utah, USA, on display in the Galerie de paléontologie et d'anatomie comparée, Muséum National d'Histoire Naturelle, Paris, France. English : Skull and neck vertebrae cast of an Allosaurus fragilis specimen from Utah, USA, on display in the Galerie de paléontologie et d'anatomie comparée, Muséum National d'Histoire Naturelle, Paris, France. Crab spider (Xysticus sp.) lurking on Marsh Cranesbill (Geranium palustre) in Oberursel, Germany. English : Crab spider (Xysticus sp.) lurking on Marsh Cranesbill (Geranium palustre) in Oberursel, Germany. English : The Japanese fishing vessel, Ryou-Un Maru, is sunk in the Gulf of Alaska after receiving significant damage from the Coast Guard Cutter Anancapa crew firing explosive ammunition into it 180 miles west of the Southeast Alaskan coast on April 5, 2012. The crew was successful and sank the vessel at 6:15 p.m. in 6,000 feet of water by using explosive ammunition and filling it with water. The chemical element bismuth as a synthetic made crystals. The surface is oxide free. Additional a high purity (99.99 %) 1 cm³ bismuth cube for comparison. English : The chemical element bismuth as a synthetic made crystals. The surface is oxide free. Additional a high purity (99.99 %) 1 cm³ bismuth cube for comparison. English : A Leaf-miner fly (Melanagromyza sp.) lays eggs into the stem of Anthriscus sylvestris. Hippopotami (Hippopotamus amphibius) at the Whipsnade Zoo in Dagnall, England. English : Hippopotami (Hippopotamus amphibius) at the Whipsnade Zoo in Dagnall, England. English : Dynamics of fMRI-based neurofeedback training: sensorimotor cortices responsible for finger movements. Left and right sensorimotor cortices (SMC) were identified on single subject level using a functional localizer task (green blobs). During four weeks of training (three sessions per week), the fMRI signal difference between the left and right SMC, elicited by motor imagery, was visually presented to the subjects in real time. Each session consisted of two runs of right-sided and left-sided imaginary movements each. For a successful subject, each run was analyzed using FSL and thresholded using iterative two-threshold analysis (Abstract number: 5312). Activation (red-yellow) and deactivation maps (blue-white) were overlaid on the subject’s cortical surface reconstructed using Freesurfer. The videos demonstrate that, during the initial sessions the right-hand training recruits an ipsilateral deactivation, whereas the left-hand training elicits a higher contralateral activation. In the second half of the training sessions the ipsilateral deactivation vanishes and the strength of the contralateral activation reaches a plateau for both hands. Broadway Tower, an English folly. 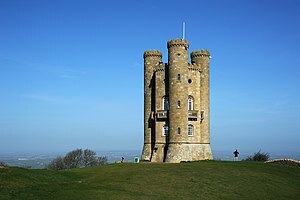 English : Broadway Tower, an English folly. English : Ring of Fire Eclipse as seen from the Chico Community Observatory on May 20, 2012. This sequence is at about double speed and taken with a Coronado 60mm Solar telescope. Durdle Door is a natural limestone arch on the Jurassic Coast in Dorset, England. English : Durdle Door is a natural limestone arch on the Jurassic Coast in Dorset, England. English : This video shows, How A Sheet Cutter Machine Works in a paper factory. In this sheet cutter, cuts paper from large paper rolls to suitable size of sheet. Steinway & Sons upright piano in high polish polyester finish, model K‑132 (height: 132 cm / 52 in, width: 152.5 cm / 60 in, depth: 68 cm / 26.8 in, weight: approx. 305 kg / 670 lb). English : Steinway & Sons upright piano in high polish polyester finish, model K‑132 (height: 132 cm / 52 in, width: 152.5 cm / 60 in, depth: 68 cm / 26.8 in, weight: approx. 305 kg / 670 lb). English : Video on a petition to US president Obama to "Make Publicly Funded Research Freely Available". View of a canal in the centre of Ghent, Belgium. English : View of a canal in the centre of Ghent, Belgium. English : A couple of Tachypeza nubila (Hyobatidae)shows its special copulation behaviour. Cheetah (Acinonyx jubatus) portrait at the Whipsnade Zoo in Dagnall, England. English : Cheetah (Acinonyx jubatus) portrait at the Whipsnade Zoo in Dagnall, England.